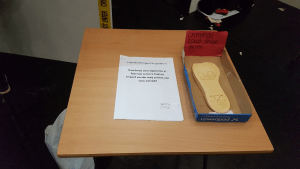 A break in… a theft… find the evidence… analyse it…solve the crime!! Can you do it? Free fun and exciting drop in 29th July, everyone welcome. Come and visit us at our crime centre Lodge Street, Skelmanthorpe, Huddersfield. HD8 9DR and help track down the criminal behind “The Great Art Heist”. this is a family friendly event and is suitable for all ages. Doors open 10am last entry 3pm. *Learn how to develop and identify fingerprints like the professionals. *Use digital microscopes to look at hair and fibres. *Make a composite picture of the criminal. *Examine soil and footwear marks. Read a totally independent blog by Jessica and Glen following a visit to one of our recent events. 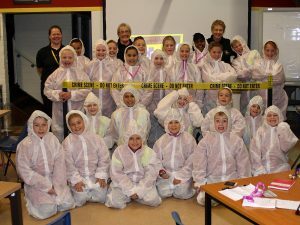 At Think Forensic, we are proud of our vision to help as many people as possible engage with and have fun with Science. From Primary schools to Corporate training we see the advantage of using Science to learn and develop. Recently we were approached by a student looking for help with her EPQ and we were delighted to assist; Please read a small summary of her work assisted by Think Forensic. My project on the development of forensic science and how it has had an impact on the way crimes are now solved. I am an 18-year-old college student who is doing the EPQ (extended project qualification). For those of you who haven’t heard of this, this is an extra qualification you can do, and you are given the freedom to choose any question you would like to research about with a dissertation and presentation produced at the end of this. I decided to research on the developments of forensic science and whether they have had an impact on crime solving. I am a biology and chemistry student who in my free time enjoys looking at case studies and watching documentaries on new developments in crime investigating. This is the main reason why I based my question on forensics as it’s a topic I’m very much interested in and passionate about. 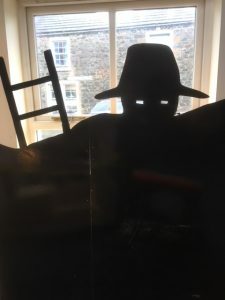 There were many things I needed to research when it came to be writing my dissertation such as, going back to the past and to talk about where forensics had originated from, all the way to the modern developments used widely today. In addition, I also researched on the future of forensics and the developments which haven’t quite reached the surface but are still being worked on such as the rotating camera device. This takes photos of a scene and a software programme puts this all together. When in the courtroom the jury can virtualise the actual crime scene along with others and have a feeling of walking around the room. After all my research and essay had been completed, the final step was to present my findings and show people the outcome of my project. I was given a display board which I could put up some of the areas I investigated. Things which were displayed were: fingerprints of my own, I did this by using an aluminium fingerprint powder and some fingerprint lifters and mounts given to me by ‘Think Forensics’, case studies such as how ballistics was used in John F Kennedys assassination, some down points of forensics such as cross-contamination in Meredith Kerchers investigation, facial reconstruction, forensic dentistry and fingerprinting. 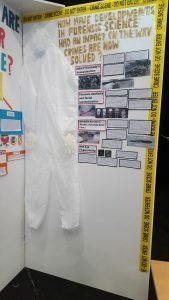 I had also displayed a forensic suit, to give people an idea of what is usually worn by forensic scientists and explained why it was vital for it to be worn. The presentation was amazing and sharing my ideas and findings to others felt incredible. Of course, if it weren’t for ‘Think Forensic’, I wouldn’t have been able to set up my presentation and display it the way it was with actual equipment used in forensics to show others a real representation of some techniques used in forensics. For many people, the world of a CSI is seen as a viewer, while watching one of your favourite TV shows or world-famous detective but in reality, it’s all about detailed scientific observation and real-time methodical collection of facts, figures and evidence; once all this is started then the ability to communicate clearly and efficiently is paramount to solving any incident and providing evidence that can sustain real scrutiny. 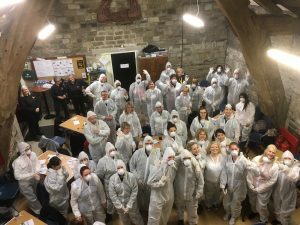 At Think Forensic all our team are real-life professionals who have worked real-life incidents from start to conclusion; with this, in mind, we thought you would like to read about some of the topics we share with you on our experience days. The above are just a few things that Think Forensic can teach you, but that’s not all; we can adapt our skills and scenes to make fun training and great parties at our bespoke venue (the only one of it’s kind) with real crime scenes all set up ready for your own personal experience. We love to encourage young people in the sciences and run school ‘science clubs’ that encourage young people to engage in science and develop a love for it. Great clubs and fun events for all ages like the ‘missing carrot’ and the ‘author’s workshop’ or taking Corporate training to a new level of fun and interaction where you get to use and improve your skills and build your team confidence. My husband bought me a course here for Christmas because I’ve always been fascinated by forensics and crime scene investigation. We attended yesterday and it was sooo good! Paul and Sue were friendly, funny and incredibly experienced so kept us all engaged the whole time. Learning about finger prints, shoe print casting and collecting fibres and hairs was great. The ‘crime scenes’ are really detailed and well thought out. I have so much respect for CSIs and the whole police team who investigate crimes. Thank you Sue and Paul for being so welcoming and showing us how it all works!